For many decades identity politics has been the most widely accepted approach to oppression and this has contributed enormously to the idea that oppression and class can be severed from one another. In popular discourse oppression is often understood as racism, sexism, homophobia, transphobia and so on. Discussions of the oppression of the working class are uncommon, despite the fact that it is the largest oppressed group. And for many proponents of identity politics the working class are not only omitted as victims of oppression but are seen as a primary agent in the oppression of women and minorities–thereby obscuring the existence of whole layers of the class who suffer special oppression. Several useful critiques of identity politics and oppression-first theories exist. Sharon Smith’s 1994 article “Mistaken Identity” is a brilliant and scathing critique of identity politics that explores its conservative conclusions and its origins as an expression of retreat from struggle. (1) The aim of this article is not to rehash the ground already covered by others; instead it focuses on various erroneous approaches to oppression put forward by theorists within the Marxist tradition. Exploring these positions has become particularly important given the changing landscape around these questions. Reductionism involves over-simplifying complex phenomena, either by discounting contradictory elements of a totality or by collapsing them into other elements without accounting for their specific characteristics. (2) Class-reductionist perspectives on oppression vary in the ways they do this. The two distinct perspectives that this article focuses on are anti-essentialism and abstract reductionism. Anti-essentialism sees identity as a false construct and an obstruction to the class struggle; while the approach I refer to as abstract reductionism sees oppression as external to the structures and impulses of capitalism. Those within these respective currents disagree on certain points, but both ultimately discount the importance of oppression to capitalism and the importance for Marxists of struggles against oppression. Identity is not a straightforward concept. The way it is constructed, embodied, performed and politically understood is complex and contested. Marxists have generally recognised that there is nothing trans-historic or permanent about particular categories of identity. This stands counter to an essentialist reading that takes race, gender, nationality and sexuality as given and natural. Identity politics lends itself to such an essentialist reading of identity. It focuses on the readily observable differences between different identity groups and, rather than interrogating the basis of these differences, calls for those who are part of a marginal or oppressed identity group to bind together in pursuit of their shared interests. Even those who put forward more structural analyses and solutions within an identity politics framework, such as patriarchy and whiteness theory, tend to base their analysis on essentialist assumptions. Given the prevailing influence of identity politics, it is unsurprising that dispelling this essentialist notion of identity is a concern for contemporary class-first thinkers. For the anti-essentialists, a group of Marxist academics mainly in the U.S., it is the key focus. These observations, while somewhat valid, are too one-sided and do not encapsulate the full complexities of oppression and ascribed stereotypes. The characteristics of race and gender are somewhat malleable, depending on the changing targets and nature of oppression. This is most clearly the case when it comes to racism. Racism did not exist prior to capitalism but rather was created with the rise of slavery, the establishment of modern states, colonialism, imperialism, and so on. The stereotypes used to designate race are not fixed, and indeed, they often endure well after they have served their purpose. Take Islamophobia as an example. While there is a long history of anti-Arab racism and prejudice towards Islam in the West, the notion of Muslims as a race has only been solidarised in the context of the “war on terror”. It is also the case that the traits attributed to Muslims or Arabs have changed dramatically. Where they were once subjected to the paternalistic tropes of mysticism and orientalism, they are now seen as dangerous and suspicious. And, as Phil Griffiths discusses, many of the stereotypes ascribed to Muslims today are recycled from racist campaigns of the past, for example against Irish Catholics in Australia. (7) Though an Irish Catholic identity still exists to some extent in Australia, they no longer suffer systematic racist discrimination. The material reality of oppression, and therefore identity, not only allows us to look beyond its ideological existence but also to appreciate the ways in which it can be constructed from both below and above, by both the oppressor and the oppressed. The development of a national consciousness among populations of oppressed people is an example of the contradictory nature of this process. As Benedict Anderson has pointed out, this often developed more rapidly in colonised nations than in the countries at the heart of the colonial empires. (8) As well as this being informed by the particular ways in which the colonisers organised their rule, nationalism was a formative way in which oppressed groups came to articulate and understand their oppression. Instead, we must start not with the twists and turns of rhetoric and ideology but with the actual material reality of oppression. While it’s true that oppression has, in some instances, been alleviated or pushed back through struggle, it is not the case that racism, sexism or other forms of discrimination are fading stars. Oppression rests not only–or even primarily–on explicit legal discrimination but on entrenched and systematic economic and political inequalities. Inequality on these bases persists not only because it has proved difficult to dislodge, but because it is constantly maintained and renewed. The gender pay gap is still substantial in every country despite equal pay laws. Blacks and oppressed racial minorities still disproportionately live in poverty and are still the target of state violence despite the abolition of segregation laws. Refugees face qualitatively worse oppression today than they did a decade ago. And far from benefiting from any anti-discrimination reforms, they have seen their discrimination further sanctioned. 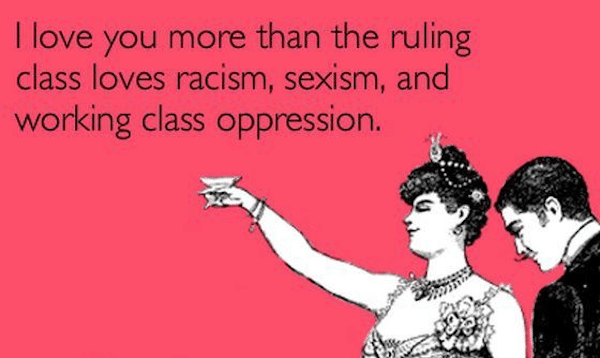 In general, the ruling class as a whole has found ways to double down on racism, sexism and a series of other forms of oppression. So while elites happily embrace the rhetoric of diversity and equality when it comes to promoting the hollow and cosmetic changes at the top of society, they have if anything moved away from pointing out racial and gender difference when it comes from the subjects they oppress. Under neoliberalism reactionary politicians have used colour and gender “blindness” as a conscious tactic to justify their policies. (17) For example, more Aboriginal children are being stolen from their families than at any time during the official stolen generations, yet there is no official policy that says children will be better off in white households. Instead this is hidden behind technocratic language and euphemisms about parenting and neglect. (18) The phenomenon of this “blindness” cuts against one of the key arguments made by the anti-essentialists. It shows that rather than the ruling class always wanting to promote the identification of non-class forms of inequality, at times they want to downplay it. Wood explains labour under capitalism as “ultimately depend[ent] on the reduction of all workers–men and women, Black and white–to interchangeable units of labour abstracted from any particular personal or social identity”. (23) This is a one-sided view of labour. And, despite Wood claiming it as a faithful interpretation of Marx, it is a reading Marx’s theory of abstract labour does not provide. While it is the case that workers’ labour becomes exchangeable–on the basis of an abstract quality: the socially necessary labour time required to produce labour-power–they do not become inter changeable. Intrinsic to the abstraction of labour are both the equivalence and variance of labour. The proliferation of capitalist production, fuelled by competition between bosses, leads to the standardisation of many aspects of production and exchange. Workers are deskilled as craft trades become progressively outmoded and technological development makes certain skills obsolete. Meanwhile bosses are compelled to attain similar or higher levels of output from workers, which means that work is sped up and made more efficient. (24) Yet simultaneously, these exact same processes lead to vast variance in the productivity, value and conditions of labour. The very growth of the scale of production leads to a division of labour that results in “the isolation of various stages of production and their independence of each other”. (25) This subdivision is essential to the accumulation of capital. As Harry Braverman explains: “In a society based on the purchase and sale of labour power, dividing the craft cheapens its individual parts”. (26) Thus, in virtually every workplace there are numerous roles and rungs of hierarchy, correlating with separate qualification requirements, skill levels and, of course, wages. And in addition there is necessary unevenness resulting from the competition between firms, industries, sectors and nation states. Some industries will adopt machines that others do not have, some countries will only have certain categories of industry, the skill level and treatment of workers will vary based on resources, wealth, stage of development as well as different outcomes in the class struggle. Harvey and Wood do not disagree that capitalism requires the subdivision of the workforce but they do not explore the phenomena that inform and arise from this subdivision. This is because they restrict their analysis of labour to its abstract qualities. In opposition to this, Marxists should understand both the abstract and concrete properties of labour and the relationship between the two. In other words, in relation to the variance of labour, it is not enough to know that it does occur. We also need to know how it occurs. An investigation of this reveals that gender and racial differentiation within the sphere of production is not aberrant or even incidental to its principles. Rather it is crucial to the variance of labour. Furthermore, because workers are simultaneously commodity inputs and human subjects, this gendered and racialised subdivision can only take place because of specific and concrete systems of material and ideological oppression. Women the world over have represented a category of workers who can be paid lower wages than their male counterparts. This is especially the case today, when more women than ever are part of the workforce. The particular exploitation and oppression of women workers is partly a result of the direct sexism that they face from bosses. But their oppression is grounded in the nuclear family, an institution which itself relies on women’s oppression, and in turn imposes material and ideological pressures on how women engage in the workforce. For example, childcare costs and the inequalities of parental leave schemes push women into taking more part time work. In addition, the ideological effects of the family and broader sexism influence which fields women choose, or are selected, to work within. At the same time as forcing women into certain types of labour, sexism plays a role in shaping the nature and conditions of certain jobs and industries. Hence the concentration of women in low-wage industries and a skew towards women occupying the lower paid roles within certain industries. Conversely, industries in which women are concentrated, often but not always because of sexist assumptions about their role, are invariably lower paid than male-dominated areas. In Australia, in the late nineteenth century, boot-making was transformed by employers from a skilled, well paid job to a low paid one by deskilling and the introduction of women. (27) A striking example of this is the unusual situation in Russia, where a majority of doctors are women and, as a result, their wages, conditions and social status are substantially less than those afforded to doctors in most other parts of the world. Racism works in a similar way in relation to labour. Racially oppressed workers are commonly concentrated in low-wage and often precarious industries and, as such, experience a specific form of exploitation and oppression at the point of production. Elizabeth Esch and David Roediger discuss this as an organised system of “race management”. (28) It involves the direct intervention of bosses in terms of hiring practices and also the use of racism to create fear among workers. It is also the result of often specially designed racist laws that deny immigrants and refugees citizenship or the right to work under certain conditions. (29) More generally, racist systems that entrench poverty work to exclude racially oppressed groups from certain positions and to simultaneously create pockets of the economy where they are concentrated in low-wage roles. Wood agrees that race and gender divisions are a relic from pre-capitalist class societies. She argues that racism and sexism are “extra-economic hierarchies of civic status”. By this she means ways of stratifying the human population that are not economic in nature. For Wood, extra-economic hierarchies were necessary under feudalism, because there was not a distinction between the economic and political spheres of society. As such, appropriation and expropriation were coordinated directly via extra economic coercion: violence, ideology and hierarchies of civic status. But, she argues, under capitalism this is not the case because “direct ‘extra-economic’ pressure or overt coercion are, in principle, unnecessary to compel the expropriated labourer to give up surplus labour”. (32) Therefore, extra economic coercion is not constitutive of capitalism and, in fact, cuts against its core logic. This totality, however, cannot be seen as undifferentiated. There are parts that are foundational, pervasive and core in a way that other parts are not. The production process is fundamental because it is the mechanism through which the central drive of the capitalist system–the accumulation of capital–is fulfilled and because it is the base of the social relations that pervade society as a whole. From this we can understand for example that though it was necessary for capitalism to come onto this earth “dripping from head to foot, from every pore, with blood and dirt”, the exact source of the blood and dirt was not predetermined. Once entrenched however, specific forms of oppression, structures and ideologies form part of the unitary whole. Not only are they then shaped by the impulses and interests of the system of which they are a part, but also, they themselves can shape the contours of that system. Most importantly, they shape the nature and particulars of class struggle. In a series of interventions into the Socialist Workers Party (SWP) in the U.S. in the 1930s and 40s, Trotsky set out an approach for socialists to take to struggles of the oppressed that remains in outline correct today. (44) The crux of Trotsky’s argument was that the struggle for Black liberation was central to the class struggle in the U.S. He argued this position in opposition to the view of some in the SWP that it would be better for Blacks to not identify as Black and therefore separate but instead to see themselves as assimilated (working class) civilians of U.S. society. This position was based on the mechanical assumption that this kind of transition would break Black workers from their cross-class community and would allow the working class movement to be more united and powerful. Trotsky pointed instead to the ongoing reality of racism towards Blacks which laid the basis for a long-lasting movement and consciousness in favour of Black rights. There is another reason this integrated approach is important. It informs but is also necessary to build a movement capable of overthrowing the entire capitalist system. For the working class to fulfil its potential of liberating itself and humanity from the horrors of capitalist society, it must become the “universal” class, capable of “represent[ing] its interest as the common interest of all the members of society”. (45) Both the struggle for and the establishment of socialism can only be based on the most radical form of democracy and equality. This means articulating the demands of all the oppressed, in order to lead them in a united struggle against the common enemy. Such an articulation can only stem from a development of consciousness within the working class of the ways in which the structures of specific forms of oppression are linked to the structures of their own oppression and exploitation. With this understanding, it’s clear that the interests of the oppressed are indivisible from those of the working class as a whole. ↩Rees 1998, pp8 and 99. ↩Adolph Reed Jr., “Unravelling the Relations of Race and Class in American Politics”, in Davis (ed.) 2002, p6. ↩Reed raises this point in his debate with Ellen Meiksins Wood and others about the relationship between race and class, arguing against Wood’s interpretation of them as fundamentally distinct. To follow Reed’s and Wood’s contributions to this debate see Reed Jr., “Unravelling the Relations of Race and Class”, in Davis (ed.) 2002 and Wood, “Class, Race and Capitalism”, in Davis (ed.) 2002. ↩Fields 2012 makes this point well, particularly in chapters 1 and 4. ↩Phil Griffiths, “Racism: whitewashing the class divide”, in Kuhn (ed.) 2005, p8. ↩Anderson 1983 talks about this in particular around the development of Creole nationalism, pp.37-67. ↩John D’Emilio, “Capitalism and Gay Identity”, in Snitow et al (eds) 1983, p103. ↩Jon Lamb, “The New Stolen Generation”, Red Flag, 12 June 2013. ↩Wood, “Class, Race and Capitalism”, in Davis (ed.) 2002, p3. ↩The treatment of 7-Eleven workers is an especially galling example of this. ↩Ken Buckley, “Primary Accumulation: The Genesis of Australian Capitalism”, in Wheelwright and Buckley (eds) 1975, pp12-31. ↩In Australia there has never been less than 30 per cent of women in the workforce. Fieldes 2013. ↩Marx and Engels 1976, p41. ↩Trotsky 1940 contains a useful compilation of the contributions from Trotsky and others on this debate. ↩Marx and Engels 1976, p59.